After getting stranded in Wellington for an extra day due to rain in the morning we were itching to head off today. Since we missed our chance yesterday to go on the Mitchell highway we decided that today maybe a little too busy along there with everyone going back home from their long weekend so we opted to take the Tourist drive route which upon my understanding was an extra 6km according to Neil ... well lets just say Neil and I are now even when it comes to looking at maps and saying "lets take that road" - I was responsible for taking us up Mt Hotham and Neil is now responsible for taking us to Mars and back!!! Those damn glasses of his don't work - it was an extra 20km today and what was worse is that it was damn hilly! and even he was knackered by the time we got here! We also had a major problem with my back wheel - along the trip it has every now and then slipped but today it was forever slipping and we couldn't figure out why. Every time Neil would straigten it and tighten it it would slip again. By the 4th time I was beginning to get mad at it and the when it happened for the 5th time and this time it moved sharply forward and I went lurching forward and was still locked in with my pedals I just flew of the handle with it - if it wasn't for Kouta in the trailer I would have slammed the bike into the ground!!! So Neil has no idea why it slips - we did notice when we put it on that the axle had a gap and Neil thought the nut he put there would solve that problem but it hasn't - hence the slipping. so Neil decided to swap back wheels and his one fits my frame perfectly where as my one still has a gap on his bike but it used another spacer (why he didn't use that on my bike originally?) and it only slipped once today and even then that is because he got caught in high gear on a steep driveway. Any how he is not getting back his back wheel as I am liking it!!! So we wasted about 1 1/2 hours fixing the wheels as we had to take off our respective clusters and attach to the wheels. The traffic was okay along this road - most were returning home from Lake Burrendong State park where they had been fishing as they all towed boats. We thought this tourist road would be flatter as it follows a railway line but it wasn't - it was very hilly indeed and there felt like more uphill than down hill and since I was so mad at my bike I wasted an incredible amount of energy that could have helped me get through the hills! To make our day even worse we had a head wind to cross wind but at least that changed at Euchareena as we turned south west and the wind was behind us. This part of the ride was still up and down but the up was gradual whereas earlier in the day some of the up was very steep. We got to Molong very late - around 4.30 and it took us 6 hours of riding to do the 85km - that's how tough some of the hills were! The campground is on the Mitchell highway and it is a very busy highway so if we had come down that road today it would have been shorter but by far worse with regard to traffic - so which ever way it was going to be bad! The campground is a council one and is quite full but we are the only campers and it has a free washing machine and dryer so despite getting here so late I was still able to do a small load of washing. 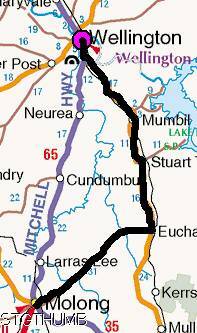 Tomorrow we head for Canowindra and Neil is not allowed to look at the map!